This week another addition to my series about showing the Collection Details, of a device, via a PowerShell form. This week I added another new tab, with more new information! This new tab show all the information about the applied Power Management settings, that affect the device. 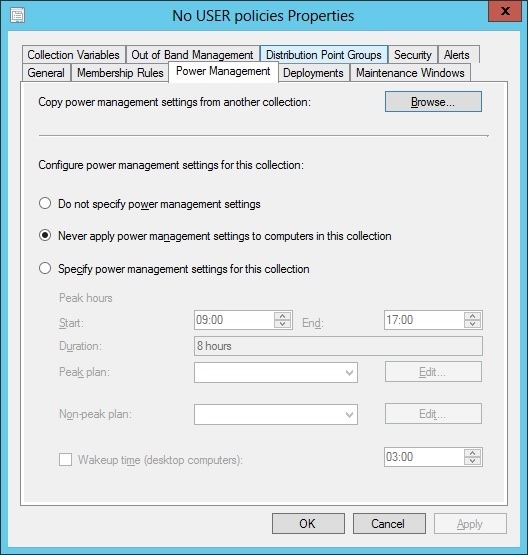 It’s also good to know that within the Power Management settings, there is an option Never apply power management settings to computers in this collection and when this option is selected the form will show a row with five times Never. So whenever a device shows a row like that, the other Power Management settings aren’t applicable anymore. The Name of the Collection Variable. The Value of the Collection Variable. The Type of the Variable (for now only Collection Variable). (NEW!) The Name of the Collections, of which the device is a member. (NEW!) The Name of the applied Non-Peak Power Plan. (NEW!) The Name of the applied Peak Power Plan. (NEW!) The Start Time of the applied Peak Power Plan. (NEW!) The End Time of the applied Peak Power Plan. (NEW!) The Wake-up Time of the devices in the Collection. Note: When there is there is no targeted Deployment, no Deployment State (like with Client Settings), no Collection Variable, no Maintenance Window, or no Power Plan then the empty field(s) will show a star (*). 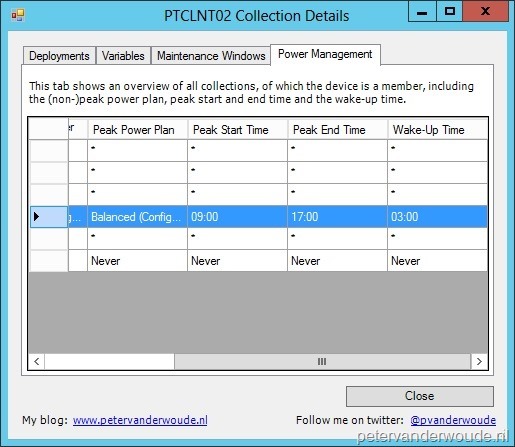 The tool will only show the name of the applied Power Management settings. In case there is a need for more information, then it’s good to know that it’s stored in a XML form (like the example under here). For an example of how to work with XML in PowerShell, take a look at an older post here. This script can be used, either ‘standalone’, or as a right-click option. The command line usage is like this PowerShell.exe -ExecutionPolicy ByPass .\ShowCollectionDetails_v0_8p.ps1 -ResourceId <ResourceId> -SiteCode <SiteCode> -SiteServer <SiteServer>. To see how to use this as a right-click option, have a look at my previous post. As of now this new version of my Collection Details Form is publicly available via the TechNet Galleries. Please let me know what you think of the form and what else you would like to see in it.